A while ago i was infatuated with making various infusions. One of the results was grappa infused with chamomile and dried apricots. So when i stumbled on a recipe that sounded nice and involved grappa i decided to give it a try. 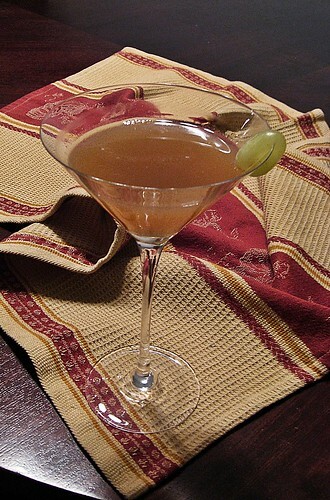 The original recipe is called Corleone and comes from the Robert Hess’s book. 6 white white grapes muddled; 1.5oz Hendrick’s gin, 3/4oz homemade chamomile apricot infused grappa, 1/2 oz lemon juice, pinch of sugar, dosh of orange bitters. The original recipe didn’t call for any herbs but to me pea just called for either mint (classic) or tarragon. Here is my formula but all credit for the initial idea goes to very talented mixologist Adam Seger! 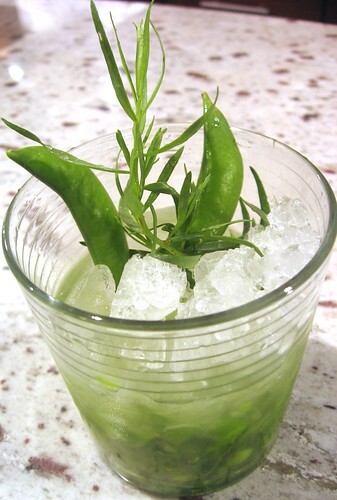 In a heavy rocks glass, muddle lime, snap peas and tarragon sprig until pods are crushed and limes juicy. Add agave syrup and gin. Fill with ice and stir. Finish with fresh cracked pepper. I’m a poor gardener: and the only plant that hasn’t failed me is lovage. It comes back year after year, just begging to be used more. So here’s to you lovage! A simple gin and tonic base. Dash of Peychaud bitters. A muddled celery stalk. 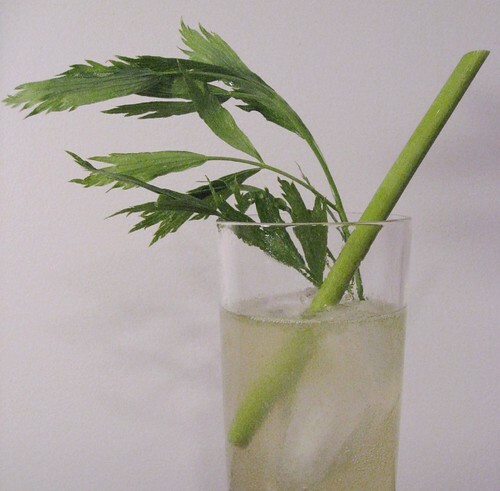 Lovage straw adds its subtle anise/celery flavor. Quite an elegant drink. recommendation from a friend and the drink of the night is pretty much sealed. 1. Muddle cilantro, cucumber, and jalapeño with lemon juice and agave syrup. 3. Shake well and strain into an ice-filled glass. 4. Garnish with de Arbol chile. My first serious attempt in creating a cocktail. 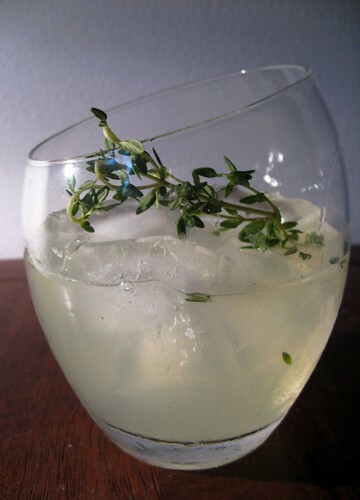 I wanted to experiment with lemon thyme and chartreuse. The inspiration came from the Green-Eye Daiquiri. I chose a daiquiri formula from The Joy of Mixology: liked the ratio and also how Regan suggested to serve the drink in an ice-filled wine glass. 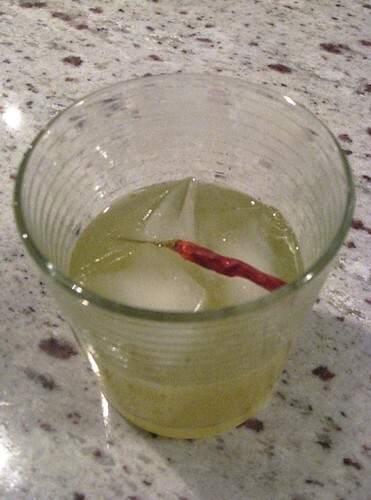 And instead of rum i went for the gin – it works well with chartreuse, and lemon juice instead of the lime. Adapted from the sources mentioned above. Instructions: Bend 2 thyme sprigs and drop into a cocktail shaker. Press the thyme with a muddler to release the flavor. Fill the shaker with ice. Measure in the gin, Chartreuse, lemon juice and sugar. Shake vigorously. Strain into an ice-filled wine glass. Garnish with the remaining thyme sprig.